Eating only raw fruits and vegetables is also called a raw food diet, living foods diet, or a raw vegan diet. Going raw, as proponents call it, entails a transition period from the typical standard American diet of cooked, processed and refined foods sprinkled with some fruits and vegetables to a diet based entirely on plant-based products. Such a diet is rich in vitamins, minerals, and fiber, but may be lacking in certain essential nutrients. People have followed raw food diets since ancient times when our hunter-gatherer ancestors picked wild plants and berries to eat. Physicians throughout history prescribed raw food diets to patients in the hopes that this natural, healthy diet would cure a variety of illnesses. Today, many raw food diet experts believe that the health benefits of eating only raw plant foods have helped them shed weight, improve energy levels, and cure many ailments. Does Raw Food Improve Mental Health? Eating only foods that have not been heated above 116 - 118 degrees Fahrenheit. The belief is that heating foods above these temperatures destroys vital life-giving enzymes. Different raw food coaches set the temperature bar at different rates, but the range of 116 - 118 degrees is typical. Eliminating white sugar, flour, caffeine and alcohol from the diet. Abstaining from meat and animal products. Some raw food followers will eat raw meat or unprocessed dairy products, but most believe these to be detrimental to health and eat only uncooked fruit and vegetable diets. Raw food followers are usually vegan and do not eat any animal products. Contrary to popular belief, however, a raw food diet is not as Spartan as it sounds. Many foods combine into delicious facsimiles of favorite cooked foods. Breads, crackers, bagels and even raw food cheesecake recipes transform basic uncooked nuts, seeds, fruit and vegetables into healthful, raw recipes through the use of dehydrators, blenders and more. While it sounds easy, eating only raw foods can be difficult. Several steps make the transition easier. Karen Knowler, a raw food coach, recommends questioning the reasons why you want to eat a raw, vegan diet, and writing down your answers. This becomes your touchstone during moments when you question your decision and helps you refine your motivation for embracing a new diet. Her website includes downloadable worksheets and advice to help you through the process. Dr. Ritamarie Loscalzo, health coach, women's fatigue expert, and raw food chef and instructor, who offers plenty of free advice, cookbooks, recipes and more. Raw People, a website devoted to the raw food lifestyle, which offers dozens of articles and resources. Frederick Patenaude, a long time advocate for raw and living foods, who offers a free introductory course on the raw food diet. These are by no means the only experts on raw and living foods, but those who focus on working with beginners who are easing their way into the healthful raw food diet. Some people dive right into this new way of eating, but most people find a gradual transition beneficial. You can begin by eliminating unhealthy processed foods, caffeine and alcohol from the diet and gradually increasing your intake of raw, vegan foods. Try preparing every meal with about half-raw food and half-cooked food. If this feels right, and you don't feel any negative effects, gradually increase your raw food intake while decreasing the cooked foods. The raw food diet appeals to people for many reasons. Some seek natural weight loss. Angela Stokes, a prominent U.K. based expert on the raw and vegan lifestyle, lost over 162 pounds by eating a raw, plant-based diet. Phenomenal weight loss stories can be found from many people who believe that eating only uncooked fruits and vegetables spurred them on to weight loss goals they never dreamed possible. The low fat, high fiber and low calorie attributes of the raw food diet are uncontested, but whether this diet is healthy for you or not can depend on many factors. Not everyone loses weight on a raw food diet since it is possible to eat too many calories by snacking on raw nuts and seeds. There are some drawbacks of eating only uncooked fruits and vegetables. The diet may lack essential vitamins, such as B12. While you might think such a diet would lack iron and protein, elements typically associated with meat, many vegetables contain adequate amounts of each. 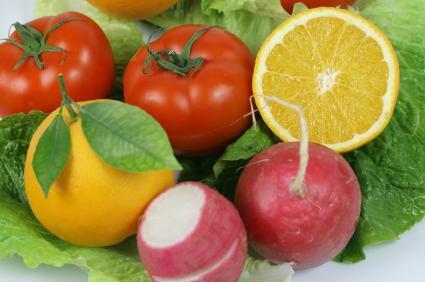 The important thing for anyone eating this diet is to eat as wide a variety of fruits and vegetables as possible, and use raw food preparation techniques such as blending, juicing, lemon juice and salt to break down the plants so that they are easily assimilated. Such techniques unlocked many antioxidants and vitamins similarly to cooking. Eating only uncooked fruits and vegetables is gentle on the environment and spares animals from slaughter. It's not for everyone, however. Explore the world of raw vegan living, and judge for yourself whether or not this is something you want to do. If you have any health conditions, do consult a physician or a nutritionist before changing to this or any other diet or food plan.